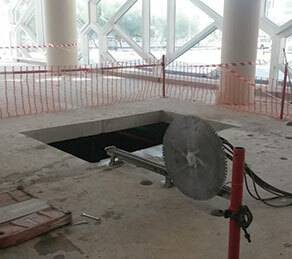 Change of use at a commercial development in Doha called for the addition of an escalator and an elevator to provide access between the ground floor and the mezzanine floor. CCL was called in as a repair and strengthening specialist to examine the new loads and assess their impact on the existing slabs, which were originally designed by CCL. After thorough evaluation, CCL provided a design to implement the necessary changes using a combination of CFRP and structural steel. In addtion to the design review for the slab, the company’s scope of work involved the use of GPR to confirm tendon locations, creating an opening in the post-tensioned slab and carrying out all necessary remedial activity. CFRP was installed around the top and bottom of the opening and the necessary steel system was designed to accommodate the new features. To avoid transferring the loads of both the escalator and the elevator - by means of columns planted directly onto the middle span of the PT slab - the loads were diverted to the main colomns by the use of H-shaped beams. CCL also coordinated the relocation of services.